I grew up thinking of Audrey Hepburn as the UNICEF lady: a serenely beautiful, soft and well-spoken advocate for starving children. It wasn’t until sometime in high school that I watched ‘Breakfast at Tiffany’s’ and realized that she’d first been a movie star whose grace and impeccable fashion sense aren’t likely to be duplicated. Not in today’s world. Grow old gratefully: In contemplating my first impressions of Audrey in her role as a UNICEF ambassador, I thought about what it means to grow old(er) gracefully. Look at any photograph of Audrey taken in the last few years of her life and you’ll see a woman who looked her age. She was, as always, exceptionally beautiful, but she appeared to be exactly who and what she was: a middle-aged woman whose joys and disappointments were evident in the lines on her face. We receive so many messages from the world aimed at stirring up dissatisfaction with the very things that we should rely upon: our bodies, our spouses or lovers, family and friends, our age and the inevitable passage of time. And yet isn’t it only with time that we glean wisdom, that we can look back and see how far we’ve come from ignorance or inexperience to understanding, or at least something like it? I’m glad for Audrey’s example of growing older gracefully, with gratefulness for the life we have, and with integrity. Work hard: Audrey was notoriously humble about her acting and dancing ability. Perhaps it was a psychological ploy to lower audience expectations, or perhaps she was just being honest. She seemed to work hard at everything she did, proof that it didn’t all come naturally. She worked long hours with choreographers for ‘Sabrina’ and ‘Funny Face’, and a voice and acting coach for her first major play, ‘Ondine’, to fill in the gaps between her capabilities and what she felt was required of the role. Audrey couldn’t sing–not like the part demanded, anyway. She practiced with vocal coaches and recorded and rerecorded the songs in an effort to get it right. As well as her own expectations, she had to contend with the fiercely loyal fans of Julie Andrews, who took their frustrated grievances to the press. In the end, and after all Audrey’s hard work, her singing voice was dubbed. When the film came out, one critic sniffed that Audrey had done only “half” the work. And yet in true Hepburn fashion, Audrey appeared unruffled, careful to take whatever responsibility she felt was hers, and keeping mum about the rest. Disappointed, yes, but not broken down, not bitter. Perhaps, in the scheme of things, and certainly considering that she’d been through war, near-starvation, and painfully sad miscarriages, it wasn’t all that difficult to put this experience into perspective. It takes strength and determination not to push back against enormous pressure and expectations, not to mention petty cruelties. When dealing with disappointment, insecurity and frustration, it helps to have a cry in private, on the shoulder of a loving, trusted friend, before determining to face the world again, and with dignity. *Both quotes from Barry Paris’s biography Audrey Hepburn. 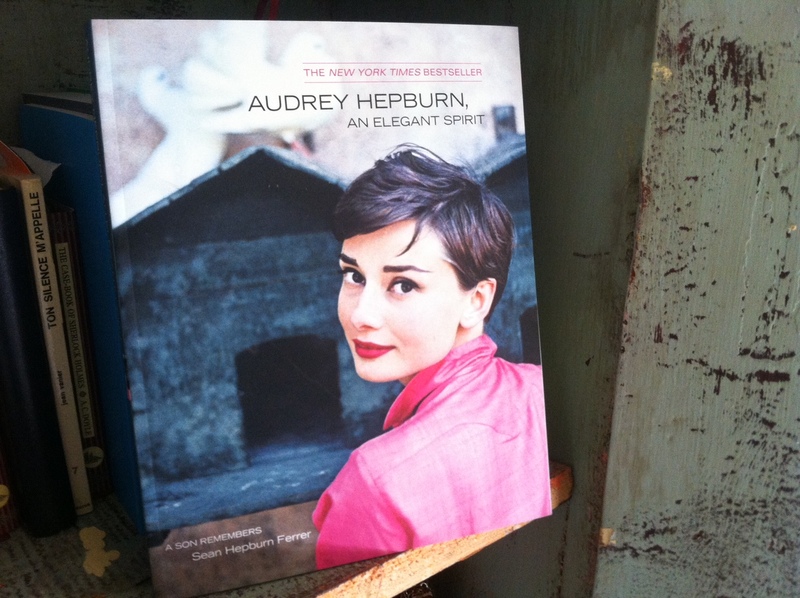 Proceeds of Audrey Hepburn, an elegant spirit go to the Audrey Hepburn Children’s Fund.